Ricky Nelson started out young, started out on the right side of the tracks, was tall, dark, blue-eyed and handsome; his recordings graced the Billboard charts on 50 occasions. His father was a bandleader his mother a singer mother so it was natural that he too went into the business. While he had a head start in the business he worked as hard as anyone at building a career and was truly there on merit. There is no doubting the quality of his records, particularly with so many of his b-sides doing well on the charts. Rick’s father, saxophone playing Ozzie Nelson was raised in New Jersey and started his big band in the 1930s and even won a competition to find New York City’s most popular orchestra, narrowly beating Paul Whiteman in the process. He had many hit recordings including, ‘And Then Some’ that went to No.1 on the chart. In 1932 Harriet Hilliard joined the band and had her first hit, a duet with Ozzie, called ‘If I Had A Million Dollars’ in October 1935; in the same month they also married. By the 1940s Ozzie Nelson and his band were appearing in ‘soundies’, short films that were shown in ‘film jukeboxes’ that did much to further their image. By 1944 Ozzie developed and produced his own radio series, The Adventures of Ozzie and Harriet. Seven years later it had moved to the television screens and proved an even bigger hit. Initially ‘I’m Walkin’ was to be the a-side, mostly as a result of being featured on The Ozzie and Harriett Show. Soon radio stations began flipping it and played David Gillam’s ‘A Teenager’s Romance’ instead; it climbed higher in the charts, reaching No.2 and was only kept from the top spot by Pat Boone’s ‘Love Letters in the Sand’. Ricky’s second record, like his debut, was made with Barney Kessel’s Orchestra; ‘You’re My One and Only Love’ features Gloria Wood and got to No.14 on the Billboard chart. 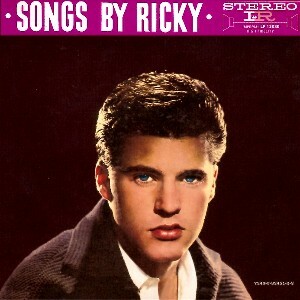 For his next single Ricky switched labels from Verve to Imperial and cut a rockabilly style number; ‘Be-Bop Baby’ got to No.3, with only the Everly Brothers and Elvis standing in its way. Soon after this Ricky got his own band together featuring James Burton on guitar, who later played with Presley for many years. Elvis later told Burton that he never missed an episode of The Ozzie and Harriet Show and liked Ricky’s singing – one of his performances usually closed the show, which is what helped both sides of many of his early recordings to chart. It has the distinction of being the first record to be officially designated as topping the Billboard Hot 100. Up until this point the chart was known as the Top 100 sides. Interestingly it was issued without a picture sleeve in the USA because Ricky had a veto over such decisions, and he did not like Imperial’s choice of photograph; it became the only one of his 45s to be issued in a plain bag. Sheeley’s song is based on her short relationship with singer, Don Everly. 1959 turned out to be a busy year for Ricky with a whole string of successful singles. He also went from the small screen to the big screen appearing in his first feature major film on his own – he had appeared in a spin off film from The Ozzie and Harriet Show as well as another with Ethel Barrymore and Leslie Caron when he was twelve. Howard Hawks’ Rio Bravo starred John Wayne and Dean Marin and Ricky sang some songs, including ‘My Rifle, My Pony and Me’ with Dean Martin and ‘Cindy’ and ‘Rio Bravo on his own, the latter song over the closing credits. The following year Ricky appeared with Jack Lemmon in The Wackiest Ship in the Army. Although only making No.9 on the Hot 100 it made No.3 on the UK charts and has remained one of Ricky’s most enduring songs. Written by Dorsey Burnette it was one of a number written for Ricky by him and his brother, Johnny, who had left Memphis to seek their fortunes in California having started out as the Rock ‘n’ Roll Trio. As the sixties began Ricky’s music was showing signs of slipping out of favor with record buyers. He was still having hits but during the first year of the new decade he failed to crack the top 10 once, only ‘Young Emotions’ made any real inroads, and that only got to No.12. Some of the material was definitely to blame. A cover of Gene Austin’s 1925 song, ‘Yes Sir That’s My Baby’ is not at the cutting edge of rock ‘n’ roll. There was talk that Ozzie Nelson’s controlling nature of his son’s career may have been partly to blame. Ricky’s father apparently vetoed his son appearing on other TV shows, well aware of his asset value. Whatever the choice of material the playing of Ricky’s band was always first rate and he always delivered a great vocal. Ricky’s second number one coincided with him becoming twenty-one it also marked a turning point, the dropping of the Y from his name – a growing up in all sense of the word. He was from this point on going to be Rick Nelson. ‘Travelin’ Man was his 25th hit on the Billboard charts in 4 years; a remarkable achievement. “Gene Pitney recorded ‘Hello Mary Lou’ about a year and a half before he gave it to me, when he used to do a lot of demos, for Aaron Schroeder”. What a gift! While it only made No.9 as the b-side of ‘Travelin Man’ it is perhaps Rick’s most remembered song. With it’s wonderful James Burton guitar solo it is one of those perfect jukebox records that instantly conjures up an aura of happy days. It got to No.2 in Britain, becoming his biggest hit. Rick’s first record with his new ‘adult’ name on it was ‘A Wonder Like You’, with ‘Everlovin’ on the b-side; neither side made the Top 10, but the follow-up, ‘Young World’ got to No.5, the same spot as his next single, the very apposite, ‘Teen Age Idol’. Another Jerry Fuller song took Rick back into the Top 10 at the start of 1963 – it was the year the British invasion began and stars like Rick soon found themselves in retreat. For much of the rest of the year Rick’s singles struggled to make any impact on the chart. ‘Fools Rush In’ during the Fall of 1963 got to No.12 and as 1964 began Rick had his last big hit of his Rock ‘n’ roll career. ‘For You’ and old 1930s song made popular by bandleader Glen Gray got to No.6. After this the man who once said, “a career is a series of comebacks,” found it hard to comeback. Musically he had lost his way. Covering old 1930s songs was an odd thing to do for someone of his pedigree. By 1966 Rick was finished with rock ‘n’ roll and pop music. He turned his attention to country music and started singing songs by Willie Nelson, Tim Hardin, Harry Nelson as well as writing his own material; among his albums is the excellent Bright Lights – Country Music. In 1969 he covered Dylan’s ‘She Belongs To Me’ and along the way the two men became friends; after Rick died Dylan sang ‘Lonesome Town’ in concert. It was in 1969 that he formed the Stone Canyon Band and went off in a country rock direction and made a number of very good but now largely forgotten albums. After a show at Madison Square Garden where he thought he had been booed by a section of the crowd for not singing his old songs he recorded the wonderful, ‘Garden Party’ which got to No.6 on the charts and gave him his first big hit in 9 years. Ironically the crowd was booing the police, but Rick was unaware of this. The Stone Canyon Band broke up in 1974 but Rick kept on touring and recording. Having always been a nervous flier and always insisted on using commercial airlines Rick bought Jerry Lee Lewis’ old twin engine DC-3, The plane was dubbed "the flying bus," and Rick used it to keep traveling the country playing well over 200 gigs a year. On New Year’s Eve 1985 he was flying to a gig in Dallas, Texas when the aircraft crashed in a field near DeKalb, Texas. The plane caught fire, trapping everyone inside, except the pilot and co-pilot, who escaped through the cockpit window; Rick, his band and his fiancé all tragically died. . 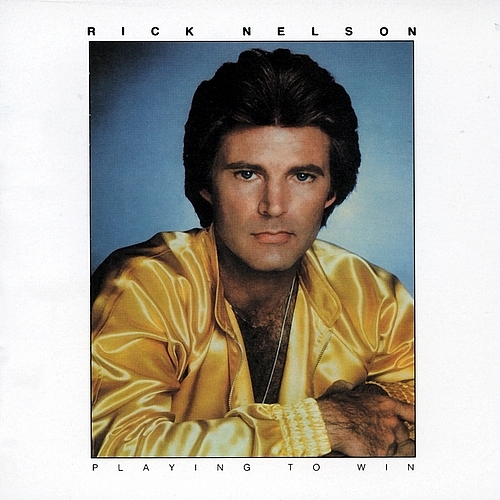 Playing to Win was an album of beginnings and endings for Rick Nelson. It was his first LP in more than three years, marking the start of his fifth label affiliation, this one with Capitol Records, and, though it was released just short of five years before his death, it was his last album of new, original material to be released during his lifetime, followed only by 1985's All My Best, a collection of re-recordings of his hits marketed on television. In his bid for yet another commercial comeback, Nelson updated his rock & roll sound to take into consideration the heartland rock of artists like Bruce Springsteen, Bob Seger, and Tom Petty, as well as punk/new wave. As always, he had great taste, which allowed him to pick great material: John Fogerty's forgotten 1975 song "Almost Saturday Night"; "Back to Schooldays" from Graham Parker's 1976 debut album Howlin' Wind; John Hiatt's "It Hasn't Happened Yet," which would become a country hit for Rosanne Cash in 1983; and Ry Cooder's lilting "Do the Best You Can." He also contributed two of his own compositions, both of which seemed to have bitter personal meanings: "The Loser Babe Is You," a romantic kiss-off perhaps directed at his soon-to-be-ex-wife, and "Call It What You Want," likely addressed to his last label, Epic Records. He never intended the result to be his final statement, but it will serve. The 2001 CD reissue adds six tracks, including the 1982 one-off single "No Fair Falling in Love"/"Give 'Em My Number"; three tracks that first appeared on the Legacy box set, among them a convincing version of Buddy Holly's "Rave On" and the previously unreleased John Hiatt song "Radio Girl." That makes three Hiatt songs on the disc, and Nelson should have done even more of them. Rick Nelson achieved his first comeback in the spring of 1961 with the double-sided hit "Travelin' Man"/"Hello Mary Lou," and he made it last into 1962 by tapping "Travelin' Man" songwriter Jerry Fuller for the further hits "A Wonder Like You" and "Young World." Nelson did not hold recording sessions for LPs per se, but rather assembled his albums from a series of sessions. In a sense, this meant that a disc like Album Seven by Rick tended to consist of tracks that hadn't already been chosen as singles, presumably because they were deemed weaker than the ones that were picked. Be that as it may, the album is a good set of songs mostly written for Nelson by his old guard of songwriters -- Sharon Sheeley ("Thank You Darling," with Jackie DeShannon), Dorsey Burnette ("Excuse Me Baby," "Mad Mad World"), and Baker Knight ("Stop Sneakin' 'Round") -- and the new boys Fuller ("Congratulations," "Poor Loser," "Baby You Don't Know," "History of Love," the last two with Dave Burgess) and Gene Pitney ("Today's Teardrops," with Aaron Schroeder). The writers have a good sense of Nelson's taste in rock & roll, even if on occasion they sound like they're trying to clone earlier triumphs ("Today's Teardrops" particularly sounds like an attempt to rewrite "Hello Mary Lou"). For once, even the covers are striking: "Summertime" is given a rock & roll arrangement that would have surprised George Gershwin, and the choice of the 1958 country hit "I Can't Stop Loving You" was inspired, even if Ray Charles was to present his overhauled version to the world within months. 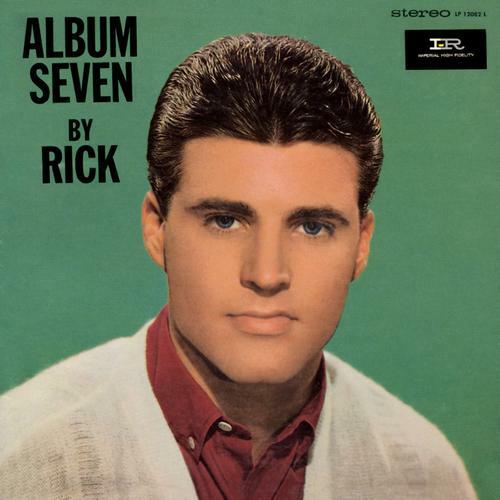 Album Seven by Rick was a disappointing seller, probably because it didn't contain any hits, not even "Young World," just then ascending the singles charts. But it is a worthy follow-up to Rick Is 21. 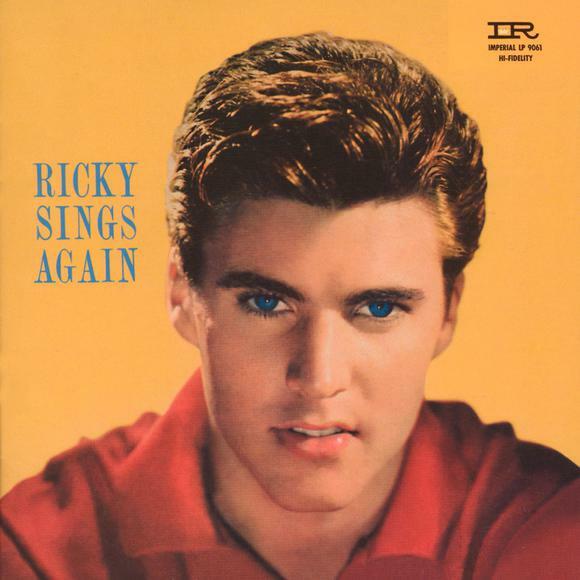 Ricky Sings Again is the third rock and roll album by Ricky Nelson, released in 1959. The Jordanaires provide vocal accompaniment. Eight of Ricky Nelson's first nine singles hit the Top Ten (sometimes even the B-sides made the Top Ten) and seven went gold. The string was broken in the fall of 1959, and though "I Wanna Be Loved," his tenth single, and "Young Emotions," his 11th, went Top 20, changes were clearly in order. The rockabilly Nelson loved and had imitated was out of fashion, replaced by softer pop music, some of it in a neo-big band style. On More Songs by Ricky, his first album in 11 months, Nelson shifted gears. One change was probably inevitable: Johnny and Dorsey Burnette, upon whom Nelson had relied for material, had launched their own solo careers and were less available to him, providing only one title, Dorsey's characteristic "Hey Pretty Baby." Nelson's other songwriting standby, Baker Knight, had three songs on the LP, but he too was adapting to the new style. His "Ain't Nothin' But Love," like another of the album's songs, "Here I Go Again," sounded a lot like the horn-filled productions of Lloyd Price, who had replaced Nelson as the country's second biggest pop singles artist in 1959. Horns, in fact, abounded on the record, particularly a saxophone that took several fat solos. Without the Burnettes, Nelson turned back to the music of his bandleader father Ozzie, cutting covers of songs from the 1920s ("Baby Won't You Please Come Home," "I'd Climb the Highest Mountain"), the 1930s ("When Your Lover Has Gone"), and the 1940s ("Time After Time," "Again") in arrangements that incorporated not only horns, but also strings and chirpy female backup vocals. It was all a big change from Nelson's previous recordings, and it did not restore his commercial fortunes. 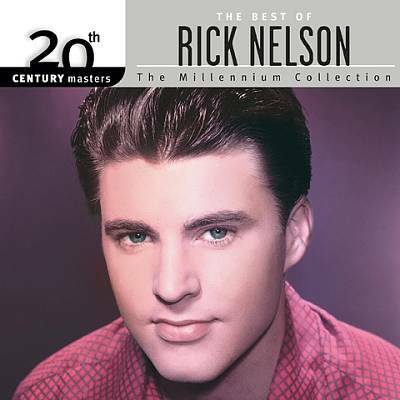 20th Century Masters: The Best of Rick Nelson covers the artist's years at Verve and Decca between 1957 and 1972. Beginning with the squeaky clean rockabilly of 1957's "I'm Walkin'" to the laid-back singer/songwriter sound of 1972's hit single "Garden Party," the collection covers a lot a ground and stylistic changes in a brief time. Twelve tracks are really not enough to do justice to 15 years worth of Nelson's career. The first six songs chart his move from rockabilly wildcat to pop dreamboat. After the romp through "I'm Walkin'," tunes like 1963's "String Along" and 1963's "For You" are lightweight mediocrities, and 1964's "The Very Thought of You" is practically a novelty number that shows Nelson to be very near to complete artistic oblivion. Luckily Nelson's achingly pure voice keeps the songs from getting too soppy, and by 1966 things start to look up as Nelson turned to country music for inspiration. His Country Fever record was an early salvo in the country-rock explosion, and that album's "Mystery Train" is a blast; James Burton tears it up on guitar and Nelson sounds positively joyous to be free from the bounds of saccharine pop. It would have been nice to have another song or two from this exciting era, but the compilation jumps ahead to 1969 and Nelson's mellow take on Dylan's "She Belongs to Me." He was firmly in the country-tinged singer/songwriter camp at this point and pulls it off very well, both vocally and compositionally. His original song from 1970, "Easy to Be Free," is a beautiful song with lovely vocal harmonies and an uplifting message. The disc includes live versions of Nelson's old hits "Hello Mary Lou, Goodbye Heart" and "Believe What You Say" that show how he was successfully dealing with his past by incorporating it into his new style. Still, it might have been nice to include more original songs from this fertile period in Nelson's career. His "Garden Party" from 1972 shows just what a talented and assured songwriter he had become. Nelson's work for Verve and Decca is worth more than a just a quick glance. A better collection is Ace's The Best of the Later Years (1963-1975), which takes more time and even shows Nelson dipping his toe into psychedelia. Of course, if all you want is the two-dollar tour, this disc does the trick: The sound is flawless, the liner notes are decent, there is a wonderful picture of Nelson at the mic gracing the booklet, and there is some great music by the truly underrated Rick Nelson.